Sanitary bin charges and what should you be paying for sanitary hygiene services at your business?. These sanitary bin charges have reduced substantially over the years as more online competition enters the washroom market place. But Be Warned many of these online companies may be part of a network group and sub contract to third parties and you might end up with the poor service provider you decided to move away from. The price of sanitary bin charges & services may vary from area to area and depending on the contract period from some suppliers. Typically if a contractors washroom service vehicle is passing by your location or are already delivering to the same retail / business park these factors will reduce sanitary bin charges and further discounts for additional items on the same site may also be applicable. 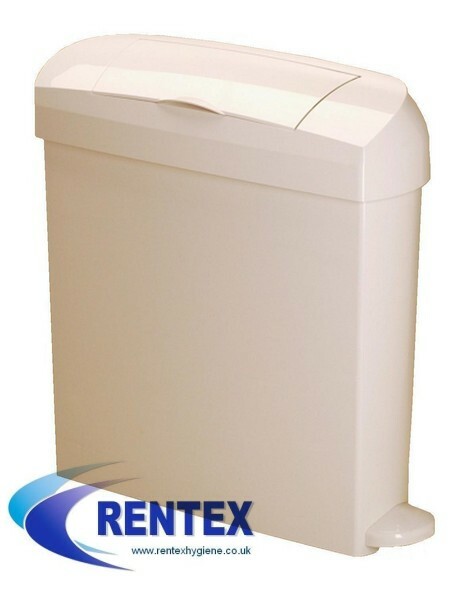 At Rentex we do not employ target based sales representatives which maintains our low service & sanitary bin charges, for a competitive washroom quotation please phone us or use the contact us link or you can use the Rentex Hygiene quick quote online quotation form and we will en-devour to save you money on your sanitary bin charges. The service frequency should be 12 visits per annum, Rentex Hygiene use hands free pedal operated sanitary bin units for maximum hygiene, these units are available in bright chrome or arctic white which is our most popular choice for washrooms. We do not promote battery operated hands free sanitary bins. Due to the environmental impact of mercury and the potential failure of the sanitary bin unit chute opening. You should realize that price is not always the best basis for choosing service providers, you should look for reliable local and fully Duty of Care licensed companies who would prove to be more proactive and become a long term business support partner rather than a sales representative’s commission based monthly target. Why Rentex Hygiene Services Yorkshire ? We are totally independent and additionally cover a large area of Yorkshire. Most of our customers use us after comparing sanitary bin charges and looking for alternative suppliers. This could be when services become unreliable whilst also experiencing large price increases. We have a standard washroom hygiene service agreement in place with all sites. This covers all areas of our charges and duty of care documentation. Typically these sanitary hygiene bins are provided free on loan for the duration of the feminine service agreement. All our feminine hygiene units are pedal operated specifically for hands free use. There is hardly anything in the world that someone cannot make a little worse and sell a little cheaper, and the people who consider price alone are that person’s lawful prey. It’s unwise to pay too much, but it’s worse to pay too little. When you pay too much, you lose a little money – that is all. When you pay too little, you sometimes lose everything. Because the thing you bought was incapable of doing the thing it was bought to do.